Ustaski has another good chance in front but Jones kicks it away with his left pad. Ustaski with another chance as Kunin wins loose puck battle in high slot. Shot hits top of Jones' left pad. Point flip by Davison creates havoc in front of PSU goal, but Jones covers before Badgers can get to the rebound. END 1: Penn State leads Wisconsin 1-0 in the Big Ten title game. Badgers had a few good shifts toward end of period. SOG 8-7 for PSU. Penn State led 8-7 shots on goal in the first period. UW's Matt Ustaski had five first-period shot attempts from quality scoring area. Three were on goal, two missed. Whistles have been put away and locked in the safe. 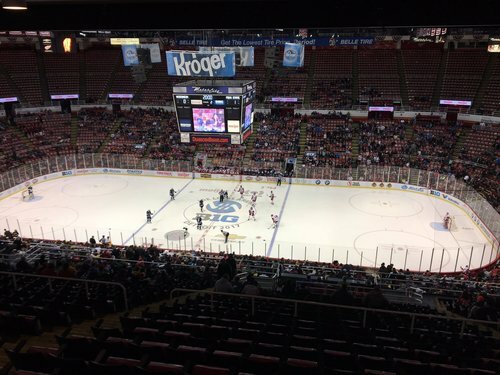 Penn State leads Wisconsin 1-0 as the second period begins. PSU's Robinson gets called for boarding 1:10 into the second period. UW on its first power play. Nothing doing on UW's power play. PSU leads 1-0 with 16:45 left in the second. Not much doing for UW on the PP. It's over now. 13:52 left in the second. PSU leads UW 1-0. Shots on goal in the second are 2-1 for the Badgers. Big shot block by Peter Tischke on 3-on-1 for Penn State. UW's Tischke blocks Goodwin on a 3-on-1 rush. Wagner chance on 3-on-2 is stopped, rebound bounces away from Badgers looking. Frank Serratore and Air Force are in the NCAA tournament, so that'll be fun for reporters at whatever regional the Falcons end up at. 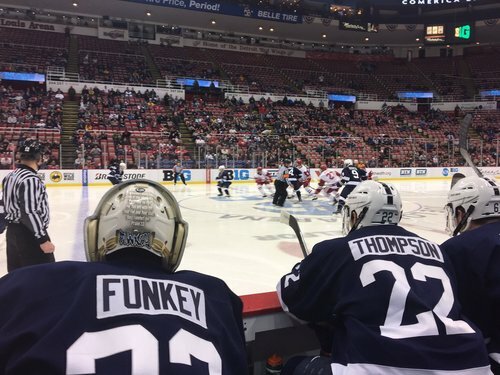 9:40 left in the second and Penn State still leads Wisconsin 1-0. We are 10:20 into the second period. UW trails 1-0. Shots are 10-10 for the game. Berry stops a Penn State shot on a odd-man rush, and the Badgers clear the rebound away from danger. Berry makes a save with his chest without seeing a puck and holds on. Badgers needed the whistle. Were exhausted. Penn State leads Wisconsin 1-0 with 4:54 left in the second. Shots on goal are 13-11 for PSU. Penn State isn't looking like the team that played 93 minutes last night and is its third game in three days. Best stretch of the game in the last minute of the second period here. Jones stops a Kunin backhand in the slot in the final minute. END 2: Penn State leads Wisconsin 1-0. Felt like most of the second was spent in the UW end. 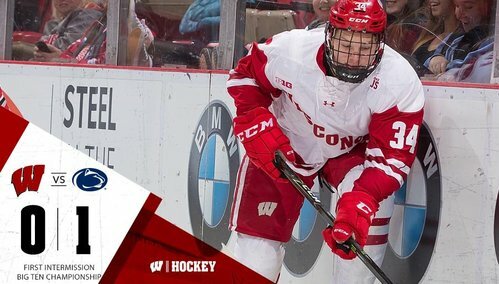 Badgers need to fix that in the third. 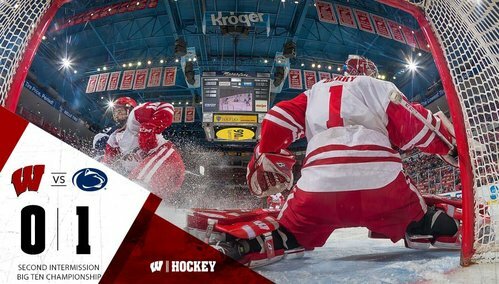 Badgers are scoreless in last five periods against Penn State. In 2014 Big Ten title game, UW never led until OT GWG by Mark Zengerle. Penn State's Peyton Jones has shut out the #Badgers for last five periods between the teams. PSU leads UW 1-0 as the third period begins. Third period is a go. 13:56 left in the third. PSU up 1-0. Shots are 19-18 for Penn State. Penn State has been doing a good job of limiting UW's time and space, especially in the neutral zone. Peter Tischke on the rush banks puck off the back boards to himself and gets off a shot. Nifty play.